At the macro level, industry sector skills describe a broad range of competencies, including personal effectiveness, academic, workplace and other industry-required knowledge and skill competencies. 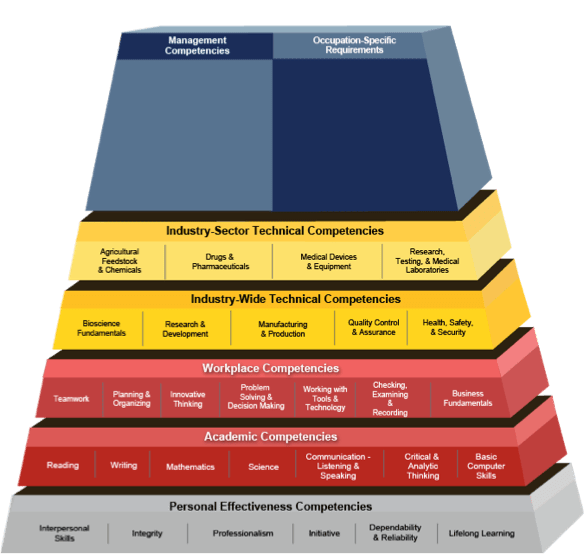 In an ideal world, industry sector skill descriptions exactly document the technical competencies required in every economically important industry. From these descriptions, curriculum, qualifications and assessments can be built to meet industry specifications. Developing an effective industry sector skills model is much like building a structure. Expertise of the sector and workforce is critical to success. Often times, however, experts struggle to articulate skill and competency needs in an effective manner. They will recite qualifications or specific technical capabilities, such as C++ programming or AutoCAD proficiency. But this kind of description typically fails to accurately describe industry workforce competencies at a holistic, macro level. To achieve a bigger picture perspective, it is better to start with foundational building blocks and then move up to more specific technical and industry-related features. When constructing a competency model, Sector Skills Councils may be a good starting point to seek out current skill/model developments (for a listing visitSector Skills Alliance). In many cases, however, models have already been developed (some across the pond) and may only require slight alterations to be fit for purpose. The CMC contains over 100 predefined competencies and key behaviours to choose from. If a competency or key behaviour is not listed, the user can simply define one to add. Once completed, the CMC produces a full-fledged description of the industry sector skills. The descriptions can be incorporated into research and reports, or used to engage employers to elevate the level of conversation and communication of education and workforce need. Within education, the descriptions can be further used to define and describe curriculum development, focusing specifically on learning objectives and identifying assessable outcomes. Equipped with perspective at the macro-level model, we can now move to the micro-level. We have viewed the forest and now we will inspect the trees. 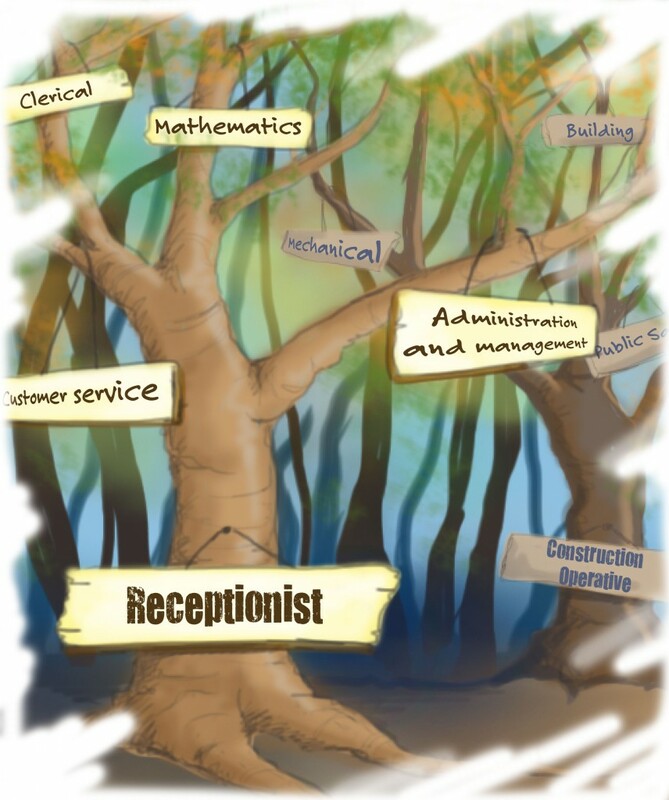 We know that sectors comprise many different occupations, which through coordinated and collaborative tasks produce a product/service for use by a consumer (e.g., a person, group of people, business, government organisation etc.). While businesses can typically describe in great detail the products or service that they produce, the average business struggles to describe the qualities and competencies of those responsible for producing their products or service. This undoubtedly is a contributing factor to the skills gap issue that we all hear so much about in the news. Skills are a major policy priority both nationally and internationally. Yet we only have very imperfect measures of the skills available and in use in employment in the UK today. This report explores the feasibility of the development of a new and comprehensive set of detailed, multi-dimensional occupational skills profiles for the UK which describe the skills required by employers and used by individuals in the modern workplace. These occupational skills profiles can have a myriad of potential uses and users, including providing a much richer and deeper understanding of the changing patterns of the demand for skills in the UK, and informing individuals and those who advise them on the skills that are useful in employment today. The report goes on to discuss the merits of O*NET and the relevant linkages between UK standard occupation classification (SOC) codes. The fact of the matter is that EMSI has already developed such a system for use in the UK. EMSI’s knowledge and skill framework describes UK SOC codes at the 4-digit level across 42 different competencies. This enables education and workforce practitioners to develop profiles of occupations to further focus discussion and interaction with business, as well as better design courses and curriculum. For instance, let’s assume you’re located in Tees Valley (Hartlepool, Stockton-on-Tees, South Teeside and Darlington) and are working on developing a skills strategy focused on Engineering and R&D. You would have undoubtedly noted that the industries comprising Engineering and R&D have added more than 3,000 new jobs since 2008 (an increase of 65%). What might not be so clear is that three of the top 5 occupations typically require a level 3 NVQ or BTEC at level 3 and comprise 13.5% of the sectors jobs. Specifically, these are laboratory technicians, production, works and maintenance managers and draughtpersons. Given this impressive growth, one could safely assume that a continued demand for skilled workers is needed. In fact, opportunity for course development, expansion or re-evaluation might even be considered necessary. Skills profiles of the occupation demand would help guide this planning and strategy effort. 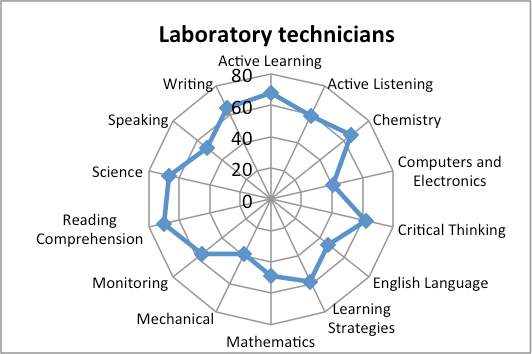 Let’s evaluate laboratory technicians. The occupation is growing and the number of job claimants relative to employment is extremely low (e.g., 33 claimants in April 2013 compared to approximately 1,400 workers currently employed across Tees Valley). The estimated annual demand for laboratory technicians is just under 50 for the next several years. Given the rapid historic growth, however, the future could very well exceed these projections. Based on the UK O*NET description: Laboratory technicians carry out routine laboratory tests and perform a variety of technical support functions requiring the application of established or prescribed procedures and techniques to assist scientists with their research, development, analysis and testing. Their top skill attributes include high values in: Chemistry, Mathematics, English Language, Computers and Electronics, Reading Comprehension, Active Learning, Science, Writing, Critical Thinking, Active Listening and Learning Strategies. The radar chart displays the relevant knowledge and skill levels that are typically needed to effectively perform the job tasks. Once education and workforce planners completely engage with businesses and receive feedback they will gain meaningful quantitative and qualitative information about skills and competencies. This information can be leveraged to build micro-level strategies at the education provider level, such as revising curriculum, identifying learning objectives, modifying assessments and so forth. As industry sectors and occupations evolve, maintaining a pulse on emerging business needs will be crucial to an area’s economic health. External outreach personnel within colleges, skills strategy experts within LEPs and sector skills councils can build both macro-level and detailed labour market intelligence into their business engagement efforts. Hamilton Galloway is an Economist and Senior Consultant at EMSI. He specialises in economic development, labour research and education planning, having also taught economics at college level for three years. Over the past several years, he has worked on dozens of research and strategic planning projects focused on reemployment, course development, skills gaps and target sector strategies. If you are currently working in the skills strategy development space and would like more information on the products and services that EMSI can provide in support of these endeavours, please contact (enquiries@economicmodelling.co.uk). also on Twitter and Facebook. For full data http://www.ukces.org.uk/assets/ukces/docs/supporting-docs/local-data/leas.zip. N.B. Darker areas show greater skills shortage per available position.